Yet again, I don't have a decent photo of Rex for today. But I do have this excellent photo of Paco the Pirate. Lynne found him abandoned in northwest Houston with another dog who was tied to a fire hydrant. 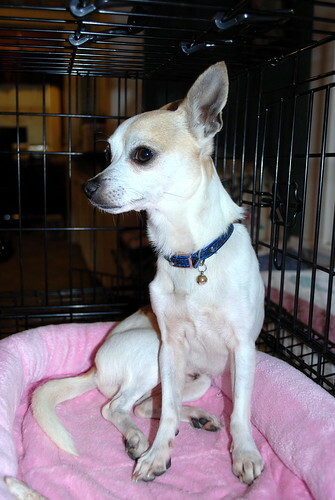 Paco the Pirate was just neutered and Lynne is now fostering him for Scout's Honor Rescue. An update... This little dog is amazing. His temperament is the mildest I have ever seen in a Chihuahua. He is healing well, but hates taking his medicine. The crate is wonderful and he will go to it when we are in the back of the house. At all other times he wants to be held or sit in your lap. He knows the leash means it is time for a walk which he loves. He is very tolerant of Sparky [Lynne's dog. -ed. note] and his barking at him. They have done the male dog dominance dance a bit. Paco and Minute [Lynne's other dog. -ed. note] get along. She tries to get him to play, but he'd rather just be held or sit in your lap. Sunday Lila [Lynne's granddaughter. -ed. note] met Paco. She was excited to see the "PUPPY!!!" He allowed her to hug, pet and "follow" (chase, I guess) as only a toddler can. She knows dogs and knows to be "soft" with them. He never growled at her and he really didn't run away. As long as an adult held him, Lila could pet and hug him all she wanted. It is hard for me to comprehend someone abandoning such a sweet, little dog.